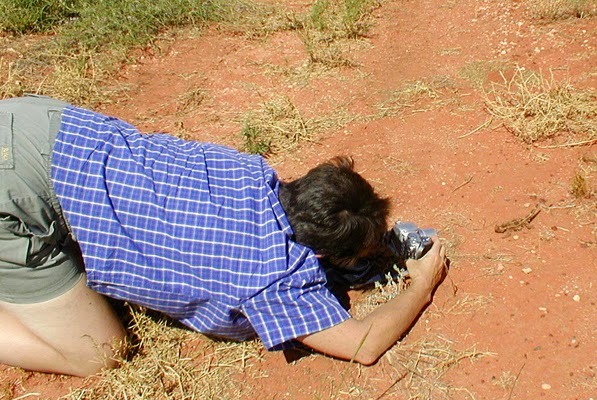 My sister photographing a Thorny Devil lizard on the side of the road in the Northern Territory. I've no doubt the plant she is kneeling in was prickly, but Thorny Devils are special. Answer to Quiz: The sculptures in Tuesday's quiz are at Ussé. No one got close. 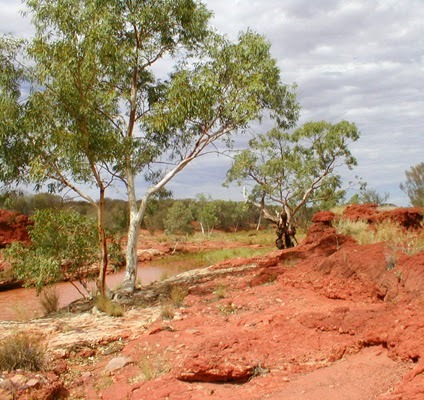 With soil this colour, no wonder the middle of Australia is known as the Red Centre. 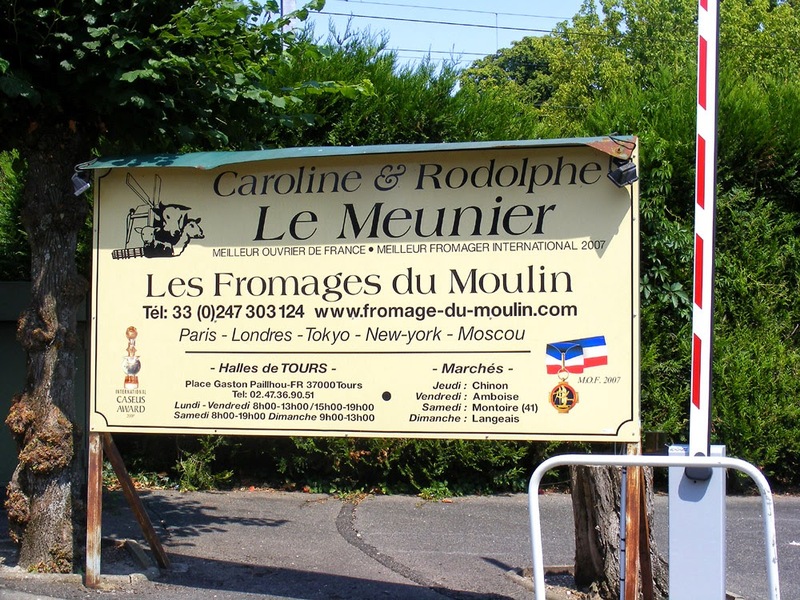 The sign at the entrance to Rodolphe le Meunier's premises in La Croix en Touraine. Earlier this month we visited Rodolphe le Meunier in his cheese filled lair. He is a cheese affineur, which is to say he buys cheeses from trusted producers all over France and matures the cheese in his specially designed facility. He then sells the cheese to restaurants and cheese shops as well as retailing it himself. Rodolphe le Meunier in the main room of the workshop. The red, white and blue stripes on his collar are the insignia of his Meilleur Oeuvrier de France (Best Worker in France) status. We visited because we wanted to organise a partnership whereby we bring clients to the facility in La Croix en Touraine and either he or his assistant take our clients through a cheese tasting or cheese and wine pairing. We think the clients are going to love it. Fromage de chèvre (goats cheese) of all different sorts, from all over France, maturing in their temperature, ventilation and humidity controlled cellar. The atelier is nothing to look at from the outside, and the inside is fairly spartan too. 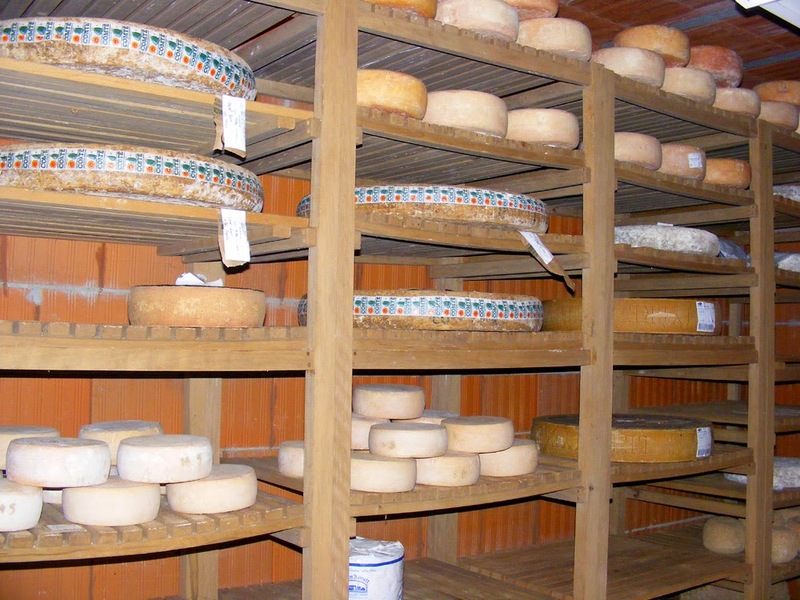 It's all about the cheese, which live on racks in different rooms with controlled temperature, ventilation and humidity according to their requirements as they age. Rodolphe told us that his father, a cheesemonger specialising in goats cheeses, bought the premises by the level crossing that the business currently occupies, and before him, his grandmother was goats cheese producer. In 2007 he won the 'Best Worker in France' award for cheesemongers and also Best International Cheesemonger. His sister runs their shop in the market halls in Tours, and they go to various local markets (Amboise, Chinon...). 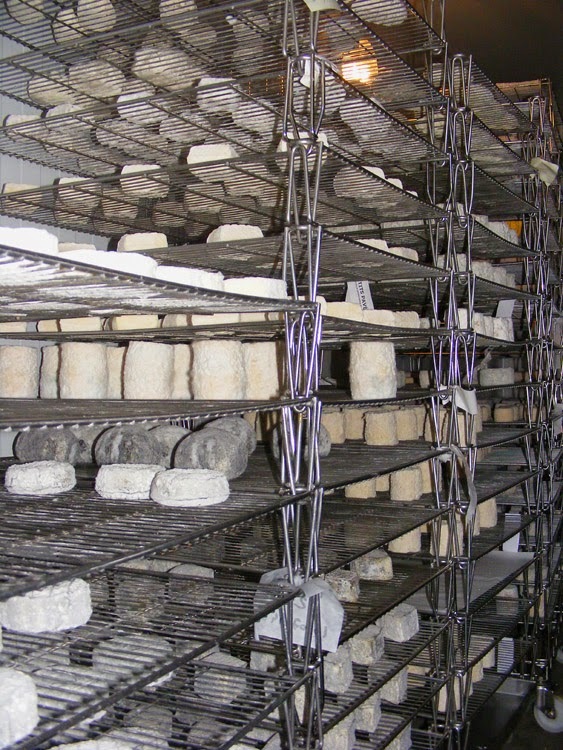 Hard mountain cheeses on racks in their atmospherically controlled 'cellar' (more like a cold room in appearance). 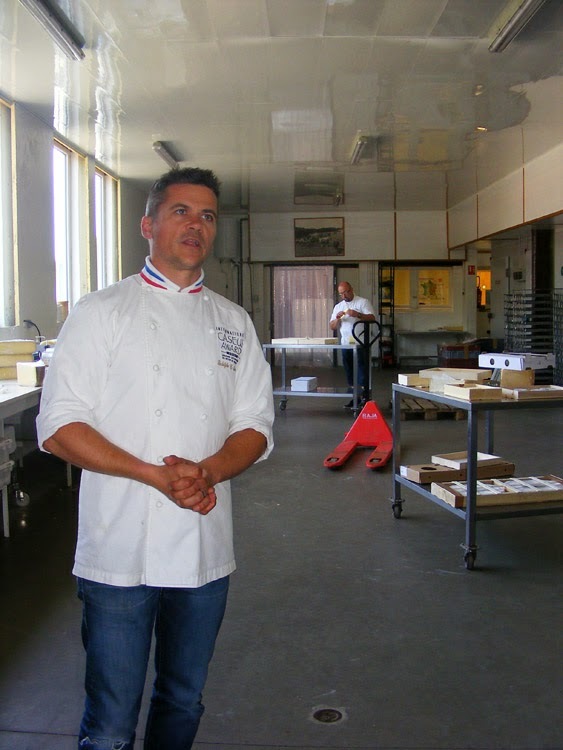 Typical of young French artisans, Rodolphe worked in the family business, but also went to college and graduated with a diploma in agricultural and food marketing. I get the impression he is extremely hard working, driven and completely committed to the business. He is also personable and laughs easily. His English is good, as is his able assistant Iris's. 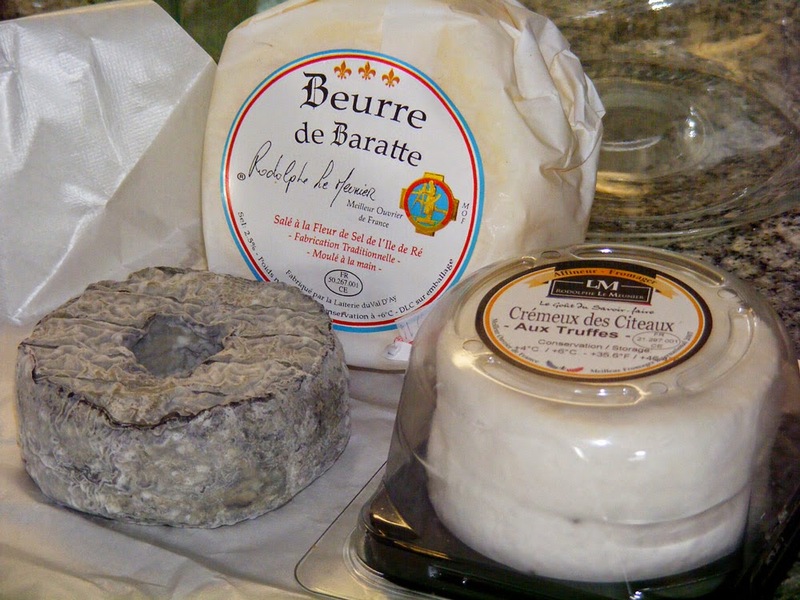 We came away with a very generous gift of Beurre de Baratte (traditionally made salted butter); Crémeux des Citeaux aux truffes (an unctuous downy cheese with a thin layer of truffles running through the centre, extremely savoury);and a Couronne Lochoise (a soft and creamy donut shaped ash covered local goats cheese). Also typical of young French food producers, he insists that the choice of a cheese starts with telling him what sort of cheese you like (strong or mild, hard or soft) then he can suggest specific cheeses that he thinks you will like. It will be interesting to see how much cheese lore we absorb by osmosis, in the way we have about wine after visiting winemakers for a time. I'm really looking forward to visiting him regularly. 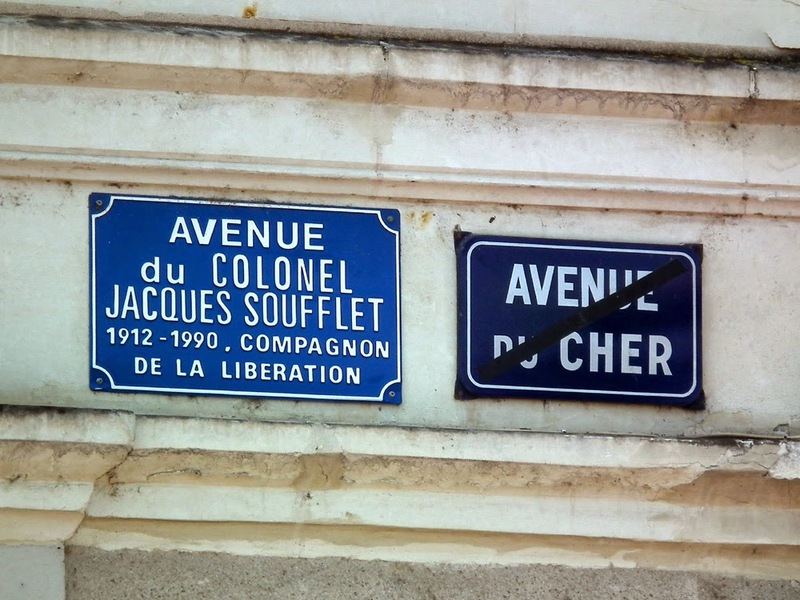 It appears that Avenue du Cher in La Croix en Touraine has recently been renamed. However, just in case your maps or GPS are out of date, they have not removed the old sign, just run a strip of black tape across it. Pragmatic or what!? 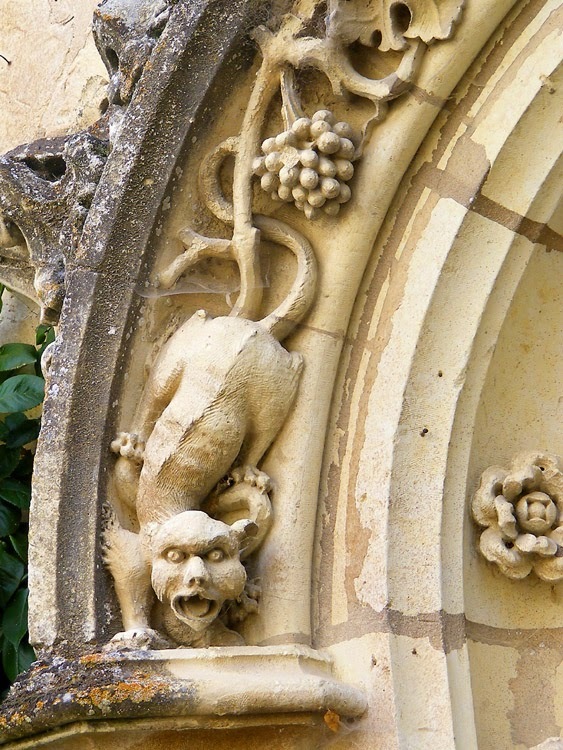 5 points to anyone who can correctly identify the chateau(x) these fearsome beasts adorn. Bonus points will be awarded if you can tell me on what part of the chateau the sculptures can be found and more bonus points for any other interesting snippet you can tell me about them. Answer to Quiz: All these sculptures are to be found at the Chateau of Ussé. The cats are over the front door, the dragon up in the wall walk level. 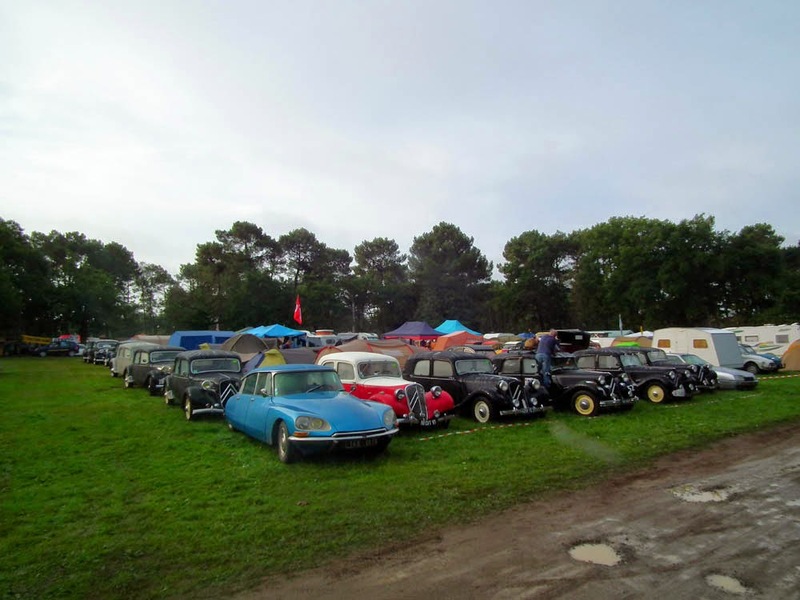 La Traction Universelle club camp at Eurocitro 2014, Le Mans. That's our tent on the left above. Maillé Massacre Anniversary: Today is the 70th anniversary of the day German troops killed 124 people in Maillé and burnt the village. We wrote about the incident here. 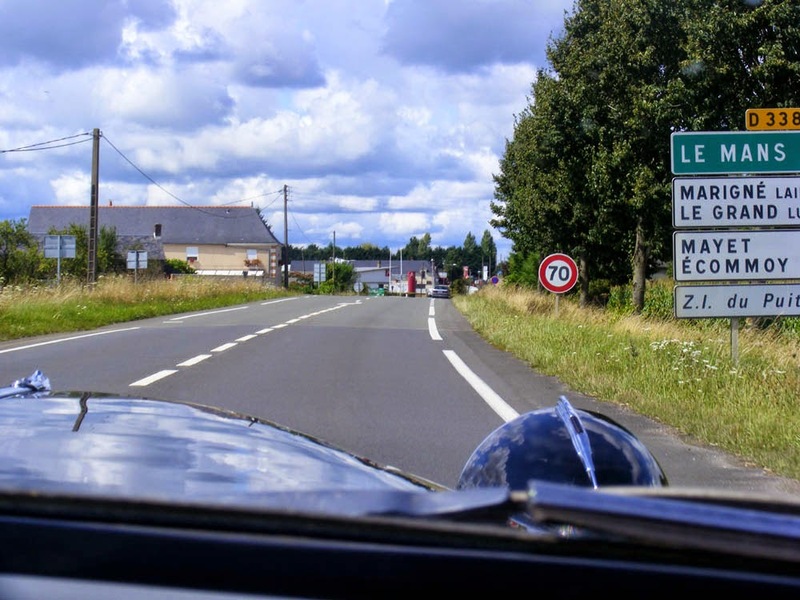 While Paris was going crazy with jubilation over their liberation, the small community of Maillé, south of Sainte Maure de Touraine was going through hell. Around 9am 70 to 100 German soldiers, probably a battalion of Waffen SS based in Chatellerault invaded the village with the intention of killing and burning. The Nazis organised the massacre in reprisal for the actions of local Resistance, which had increased over the previous few days against the occupying forces. The death toll was 37 men, 39 women and 48 children, ranging in age from 3 months to 89 years. There will be a ceremony of remembrance today, starting with a mass at 9.30 am followed by wreath laying at the war memorial at 11 am. 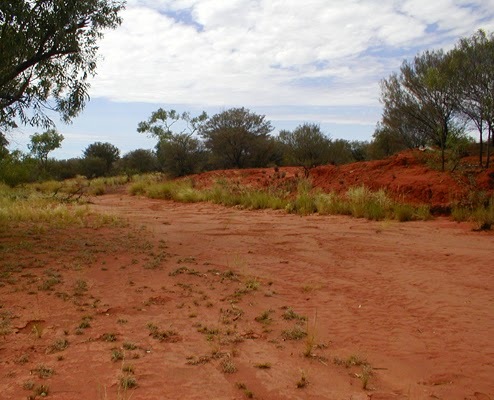 For much of the time, like most outback watercourses, Kings Creek is dry. A la cuisine hier: Blackberry Ripple Meringues, which took ages to dry out properly even using the oven fan. They are uber sweet, but delicious and still marshmallowy inside. The blackberries were picked on two of my butterfly transects. I had to dodge orb spiders galore in the grass to get them. Chicken macaroni, made with fresh goats cheese sauce seasoned with rosemary. 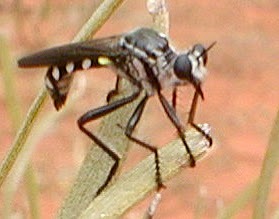 This Chrysopogon sp robber fly was photographed at Kings Creek in the Northern Territory in 2006. I remember it darted from its lookout post on a bush to catch a small bush fly that was sitting on my camera. French Expression: La rocade = 'the ring road'. 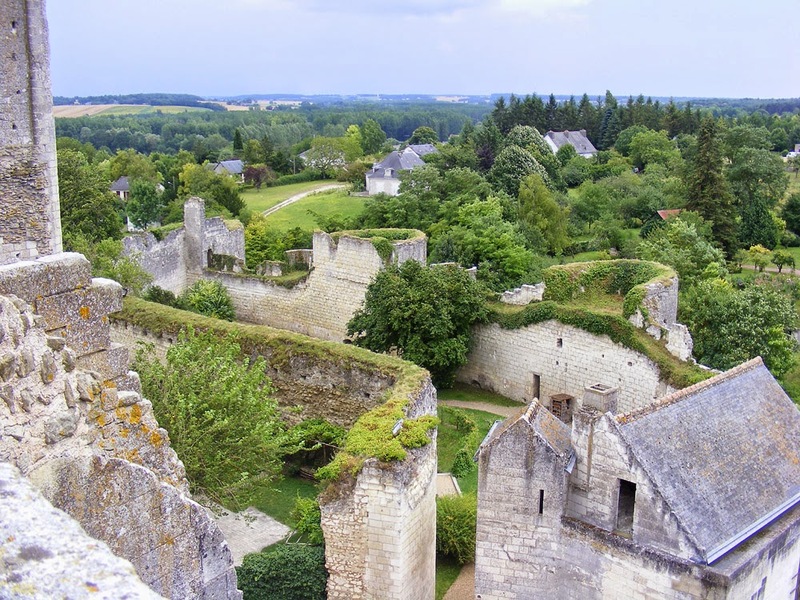 When we decided to go to Accident and Emergency with Simon's eye problem we initially went to Châtellerault hosptial, but they told us that to see an ophthamologist we would have to go to Poitiers or Tours hospital. Poitiers is much closer to Châtellerault, but we had no idea where the hospital was. 'Oh it's easy!' exclaimed all the SAMU nurses and even another patient in A&E. 'You take the autoroute then you get to la Rocade and turn right. It's well signposted'. This la Rocade place was somewhere we had never heard of, and never found en route, but we managed to get to the hospital all the same. Later, quite by chance, I was reading something unrelated and came across an explanation of la rocade. It turns out it is a regional word for bypass or ring road, not a place name. Since then I have encountered it in some directions for a botany outing later in the year too. French Expression: Un décollement de la rétine = 'a detached retina'. That's what Simon developed while camping at Le Mans recently. We feared from quite early on that his visual problem could be a detached retina, but since I didn't know the expression for it when we got to the hospital, I engaged Franglais and said we were worried it was a rétine détaché. Not by a single facial flicker did any of the SAMU nurses indicate that I had used the wrong term. They are super professional and kind! Later I was worried that I had just told them that I thought my husband had a spotless retina, but looking it up it seems they would have understood quite well what I meant, as while détachant does mean 'stain remover', détaché indeed just means 'detached' in all the same senses as English. Colle is 'glue' in French, so décoller means 'to unstick'. Planes take off in French by 'unsticking' -- l'avion décollé (= 'the plane took off'). Clingy children are collant (= 'sticky') in French. A la cuisine hier: Melanzane alla Parmigiana (baked crumbed aubergine with tomato sauce, parmesan and mozzarella cheese), a nice veggie dish from Elise at Simply Recipes. I put up a jar of sweet gherkin pickles yesterday. The pickling process takes several days, first brining the little cukes and onions then pouring hot spiced sweetened vinegar over them. Unfortunately these are too sweet for Simon's tastes, so I'll have to do another more viciously vinegary batch. 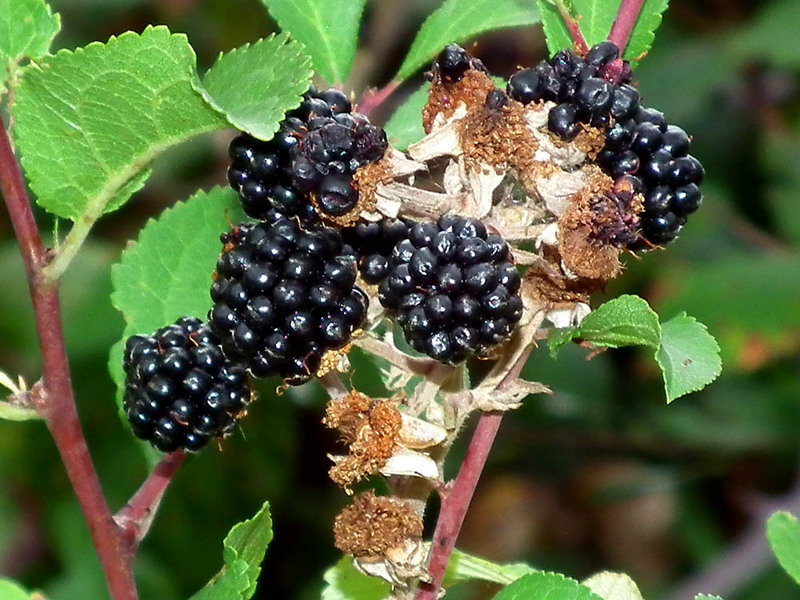 The August butterfly survey gives me a chance to pick wild blackberries on a couple of my Parc de Boussay transects. 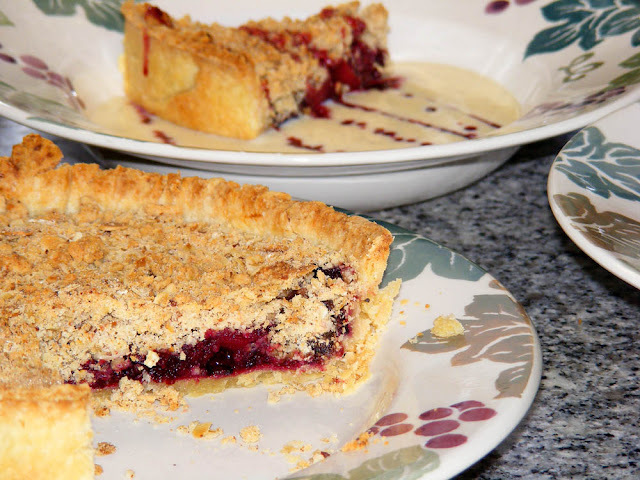 Last year I chose to combine them with windfall apples from the orchard to make Hugh Fearnley-Whittingstall's Apple and Blackberry Crumble Tart. I would have used hazelnuts from our orchard too, but they hadn't ripened in time. The recipe is in The River Cottage Cookbook and is this one, just using blackberries instead of raspberries. It's really good. If it is dry, make sure you pick them from along the side of a ditch or similar, so they've had a good supply of water to plump up the berries. Otherwise they will just be a load of seeds and no flesh. 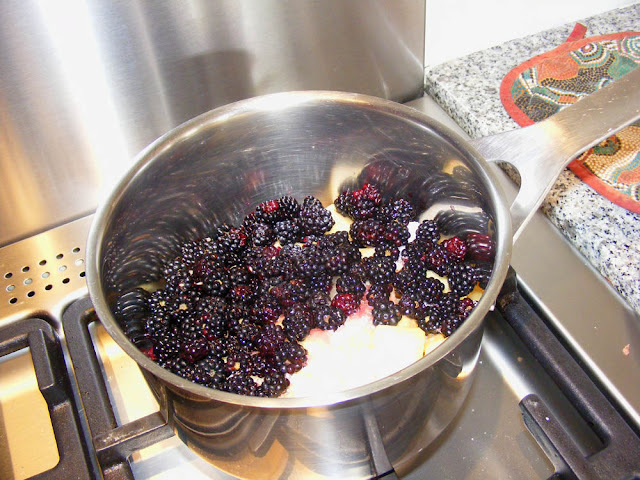 Wild caught blackberries held in a saucepan with diced apple, ready to be stewed. The pastry case weighed down with small change to blind bake it. 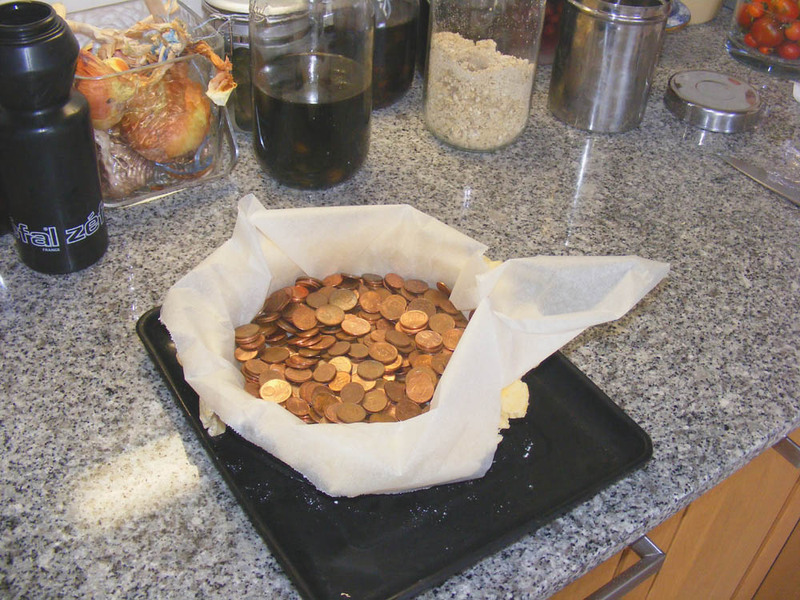 The copper coins are excellent heat conductors. 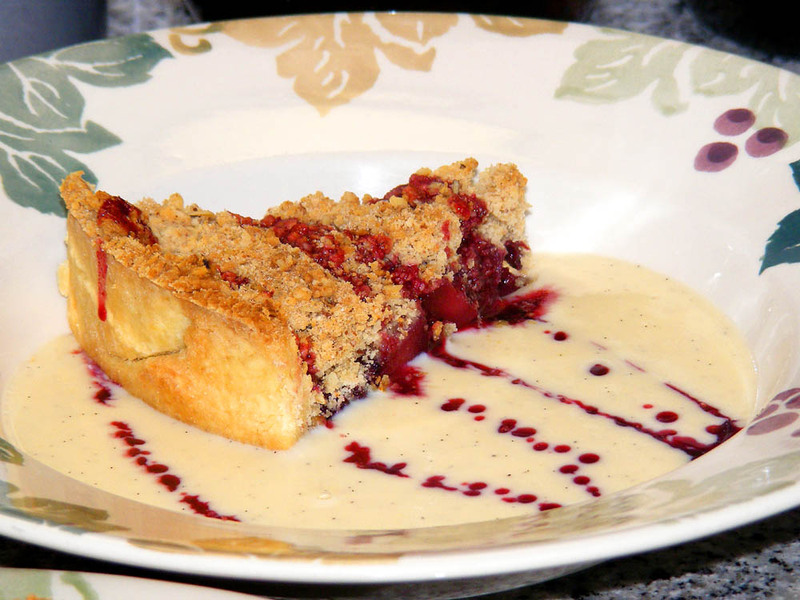 Served with home made custard and a blackberry coulis. Plenty left over, and it freezes well. French Expression: Un contrôle = 'a check up'. That's what Simon had yesterday at Poitiers hospital, to check that his eye is healing as expected after the operation a week ago. This revealed that the retina has indeed reattached nicely and the operation was a success. However, the gas bubble is causing a bit much pressure and so on top of his gazillions of drops he must now take a tablet to reduce the pressure and another tablet to mitigate the side effects of the first tablet. Cars in France have a contrôle technique (= 'technical check') every two years, usually referred to by the initials CT (pronounced 'saytay'). That's their roadworthy test. This memorial to an event at the end of World War II sits on the side of the road between Loches and Ligueil. There are dozens of similar roadside memorials in this area, most dating from the summer of 1944. 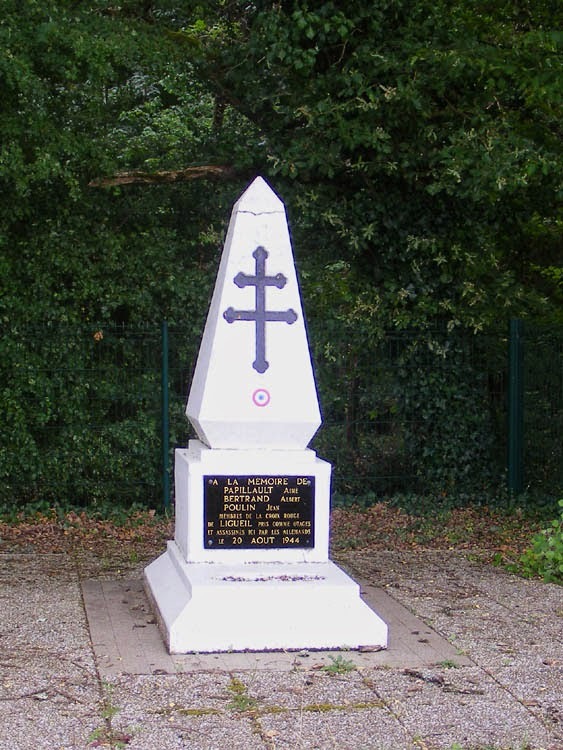 To the memory of Aimé Papillaut, Albert Bertrand and Jean Poulin, members of the Red Cross in Ligueil taken as hostages and assassinated here by the Germans on 20 August 1944. On 20 August 1944 German soldiers fleeing eastward took Aimé Papillault, Albert Bertrand and Jean Poulin, three members of the Red Cross, hostage in Ligueil as 'insurance' to shield their escape. They were intercepted by the maquis (Resistance) at a place called La Blanchardière, the edge of a small wood on the road to Loches. The three hostages were killed. A la cuisine hier: A batch each of cherry plum and mirabelle clafoutis. Also big batches of stewed Sainte Catherine plums (small yellow ovals), cherry plums and mirabelle de Metz. All the plum haul from Mme G's orchard is now processed. Is it a Road or a Racetrack? 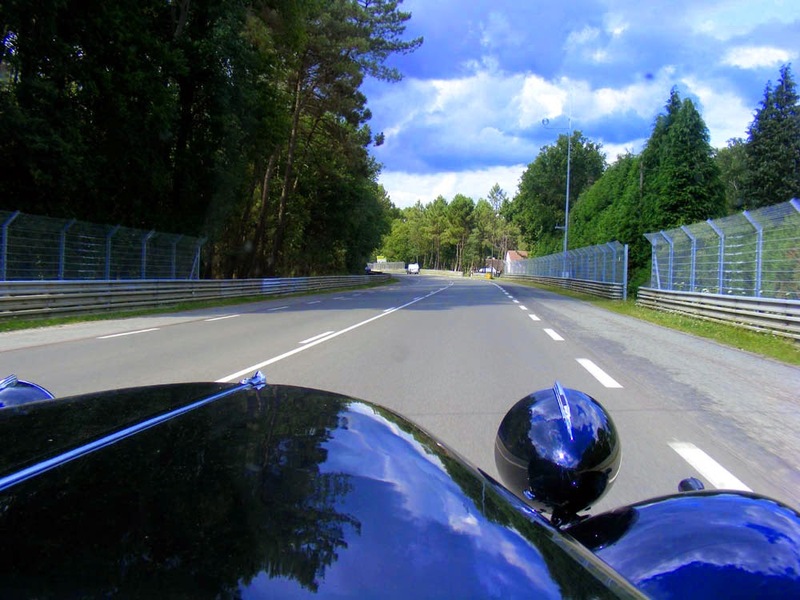 The famous 24 hour race track at Le Mans is mostly on ordinary roads. This is, I believe, the Mulsanne straight. Simon is well enough that he has made a couple of videos of our time at Le Mans the weekend before last. The first is for those who just want a flavour of the weekend and is only a few minutes long. Much of the video footage has been speeded up, because (as you can see from the second video) travelling at 40kmh does not make for riveting viewing - Ben Hur it ain't! The second is probably for car enthusiasts only, and is an entire lap of the circuit in Célestine. It was a long lap due to the presence of many (many) other Tractions. Here are some links to other people's videos of the events. We appear in all of them. A la cuisine hier: Chocolate Chip and Walnut Banana Cake. The banana in question was a refugee from Eurocitro, and had seen better days. Cooked banana is disgusting, but I hoped the chocolate would conquer both the aroma and the taste (it didn't...). Saag Aloo (Indian Style Spinach and Potato) made with our own homegrown potatoes, onions and chilli. Zucchini Bhajis -- these Indian style fritters are just like the better known Onion Bhajis, but with zucchini instead of onion. 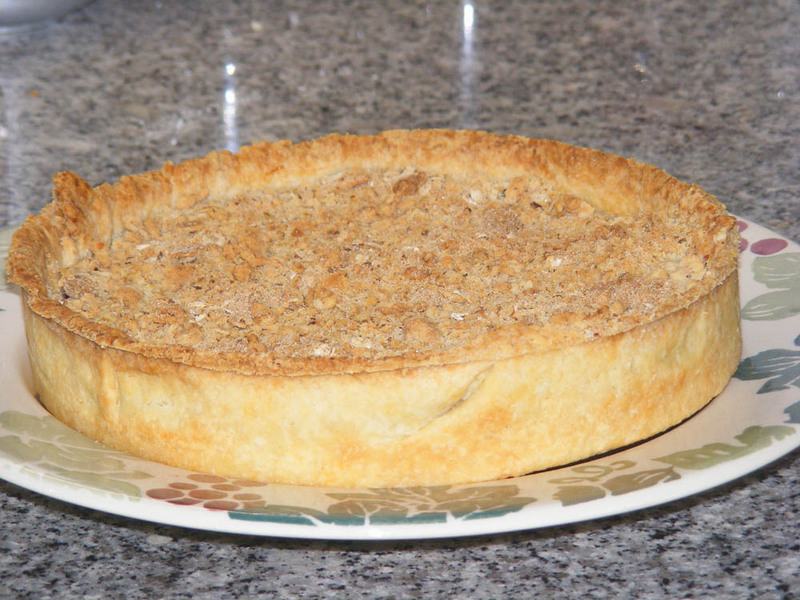 Great for coeliacs, as they are based on chickpea flour. Orchard News: Oh joy! It's aoûtat season again. These microscope harvest mites (aka chiggers) burrow just under the surface of your skin and cause the biggest reddest itchiest irritation ever. I have red itchy lumps from neck to knee. Off to the pharmacy to buy more Onctose! 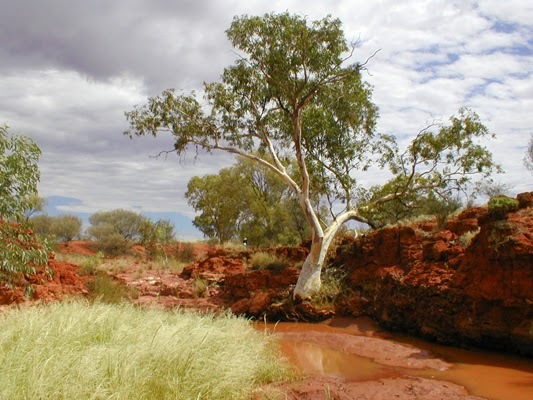 Kings Creek in the Northern Territory of Australia. A Proliferation of Plums: I ran into our orchard neighbour Mme G at the market and she asked me if I had enough plums. I said I had a big bag of mirabelles from a friend and a few plums off our own trees. She said I was welcome to pick what I wanted from her plum trees. I was to make sure I didn't miss those up the top (she meant at the top of the orchard, which slopes, rather than those at the tops of the trees). She also said not to leave it too long, as they wouldn't last. As a result I went down yesterday afternoon and raided her 10 plum trees. I now have reine claudes (greengages), round and green; big purple plums, large egg shape and size; Sainte Catherines, yellow and bantam egg shape and size; mirabelles, yellow with a red blush, cherry sized; and small round plums, rich red and slightly larger than cherries. Compote and clafoutis here we come. 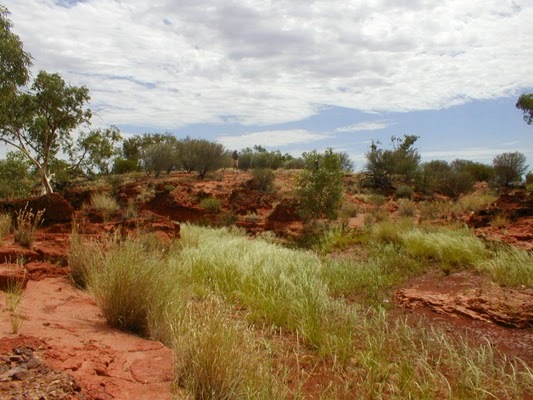 Can you spot my Dad, photographing me from the bank of Kings Creek while I photograph him from the creek bed? Orchard News: Several of the apple trees have spectacular looking apples -- large, red and not ripe yet. The pears are small but abundant and in good condition. The few peaches are still green. Some of the bunches of grapes have a bit of rot. They are still bright green ie unripe. There are still a few fruit on the Saint Catherine plum, but the remaining gages have fallen in the bad weather. The chard, celery and celeriac all look lush and green. A few small aubergine fruit are forming, and the sweet peppers are getting a purple tinge to the green. The remaining tomatoes all have blight, but are ripening some big fruit. I picked a big bowl full of ox hearts and another big meaty variety unpockmarked by the blight, some of which were well coloured. Two more plants went in a bin bag though. The melon has two fruit formed, currently the size of tennis balls. I picked what I think will be the last cornichon. The zucchini gave me a couple of medium sized fruit. The car in front of us (just disappearing from view) is a 1970's Citroen station wagon full of happy young Swiss people. They very excitedly passed us a few kilometres earlier and were clearly going to Eurocitro too. Operation Dragoon Anniversary: Today is the 70th anniversary of Operation Dragoon, the invasion of Allied troops in the south of France which took place after the more famous 6 June D-Day landings of Operation Overlord in the north. 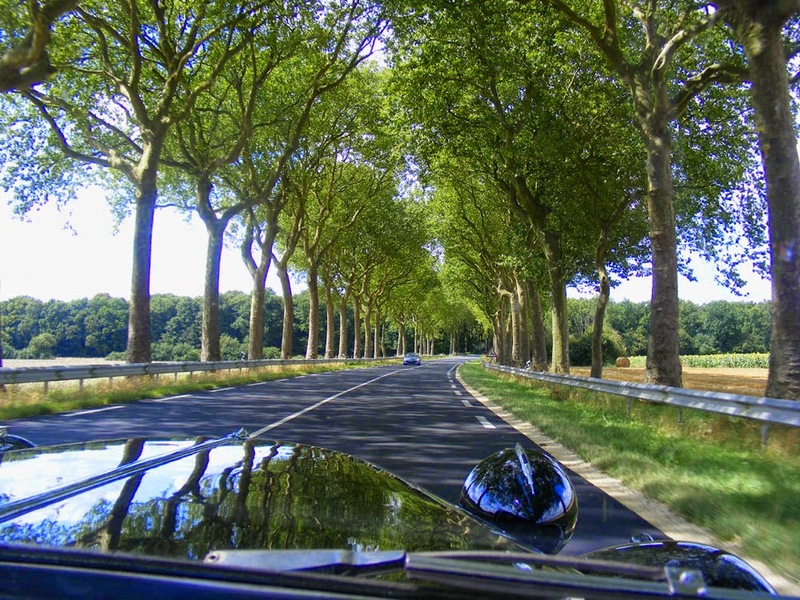 The perfect scene of driving a classic car through France in late summer. 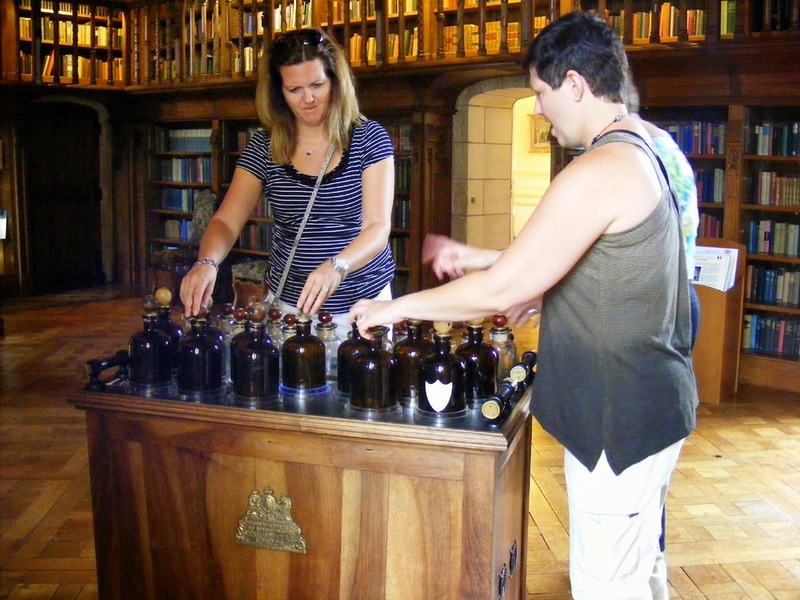 Pull the corks out of the bottles and make all sorts of spooky sounds in the library. 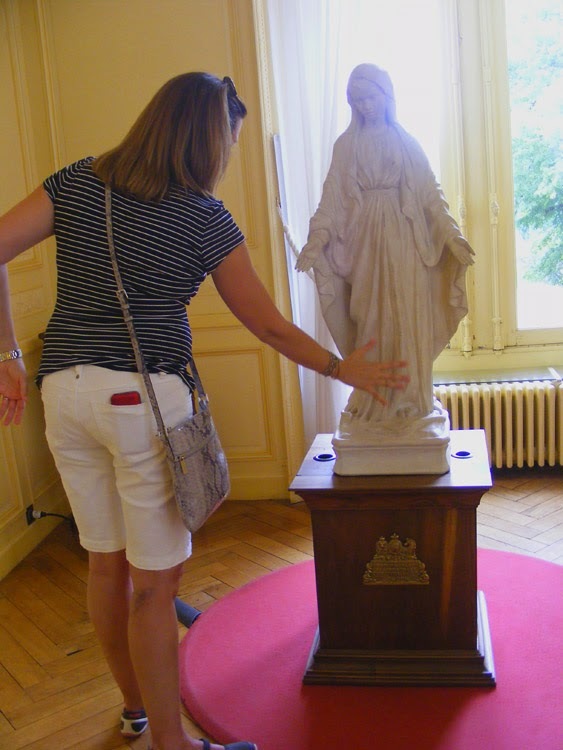 You know how in historic houses you are asked not touch anything? Well, the Chateau of Candé is a bit different just at the moment. They've installed interactive objects in every room and you are positively encouraged to touch them and play with them. Personally, I need a bit more practice before I tackle Whole Lotta Love with her. The objects are really clever. They look old, and in fact, their exterior parts are sort of found objects, carefully chosen to fit into their surroundings. But the pieces are also bang up to the minute electronic musical instruments. When you touch them or move things around, sound is produced. It doesn't take long to get the hang of them and the sounds are quite melodic or rhythmic. These are not musical. They are an interpretation of the 'electric horse' in the basement gymnasium. 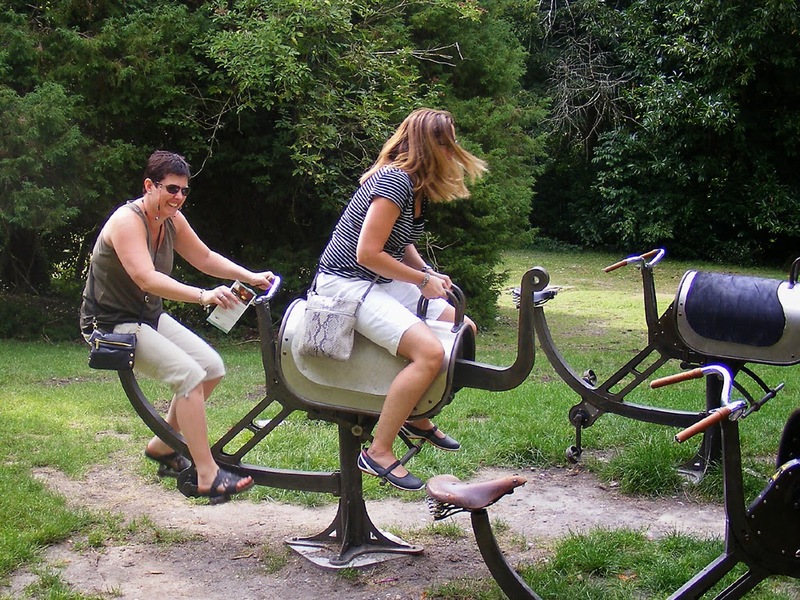 Many thanks to my trusty models, sisters Sharon and Laura, who were clients enjoying being kids again together. Simon's News: Simon is at home and resting after an operation to repair a detached retina on Monday. 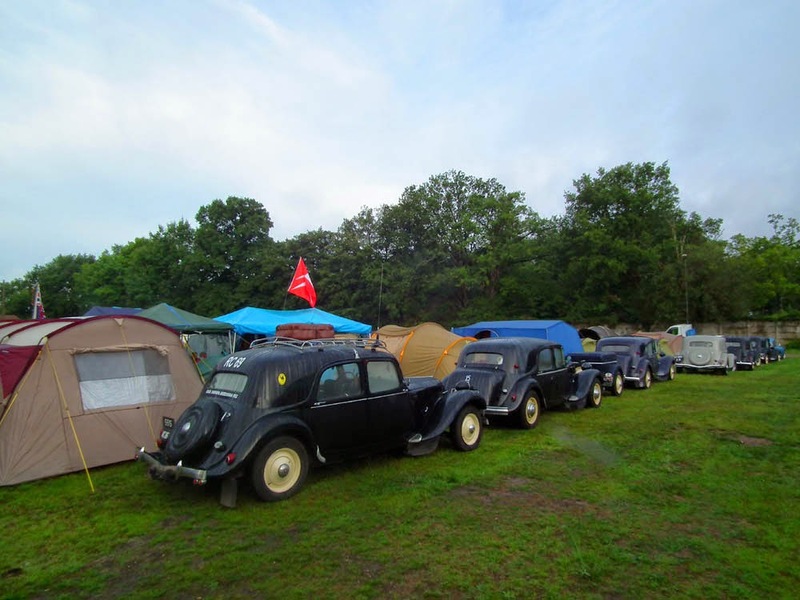 We had gone camping over the weekend at Le Mans with our car club to attend a big Citroen event there. 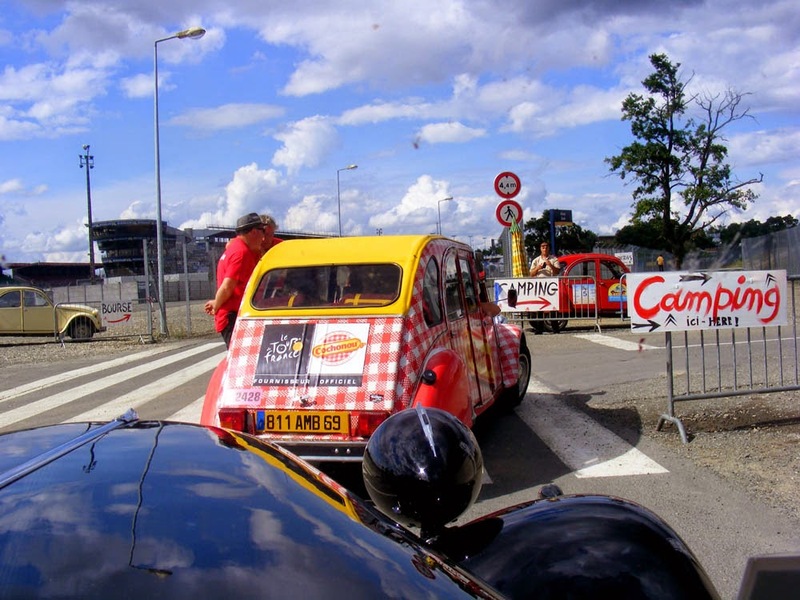 After driving the circuit of the racetrack in Célestine on Saturday Simon realised something was wrong with his vision. We packed up and came home a day early and spent the next few days coming and going from Poitiers hospital (an hour and a bit from home). The ophtalmic surgeon professes herself very satisfied with the results of her operation, but we won't know for at least three weeks what the long term changes to Simon's vision will be and his eye won't entirely recover for at least three months. At the moment the worst thing for him is the sensation of seasickness induced by the bubble of gas that has been pumped into his eye, and the fact that he has no vision in the left eye while the gas is there (just a little light penetration until the gas dissipates). He is being stoic though. French Expression: Qu'est-ce qui est arrivé ? = 'What's happened?' This is the phrase we were greeted with by all the SAMU nurses (infirmières) and doctors (médecins) at Accident & Emergency (Urgences) in two hospitals over the weekend. 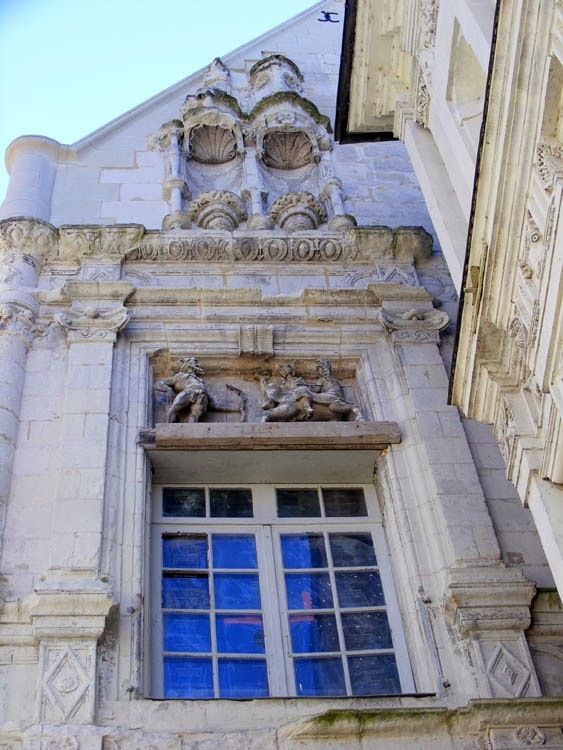 La Maison du Centaure sits in the heart of historic Loches, at 10 rue du Chateau. It is shored up with heavy timbers, awaiting some solution to the financial problems of the owners who had hoped to fully restore it and convert it into apartments. Sadly, even with grants of nearly €100 000 and a total budget of nearly half a million, the place has proved to be a money pit and the funds completely inadequate for the job. The chimneys, the carpentry, the crumbling leaning walls have all been discovered to have more problems than originally estimated. To make their money back they would have to sell the apartments for €4 000/m², nearly twice the advertised price. Only the essential structural and consolidation work has been done. 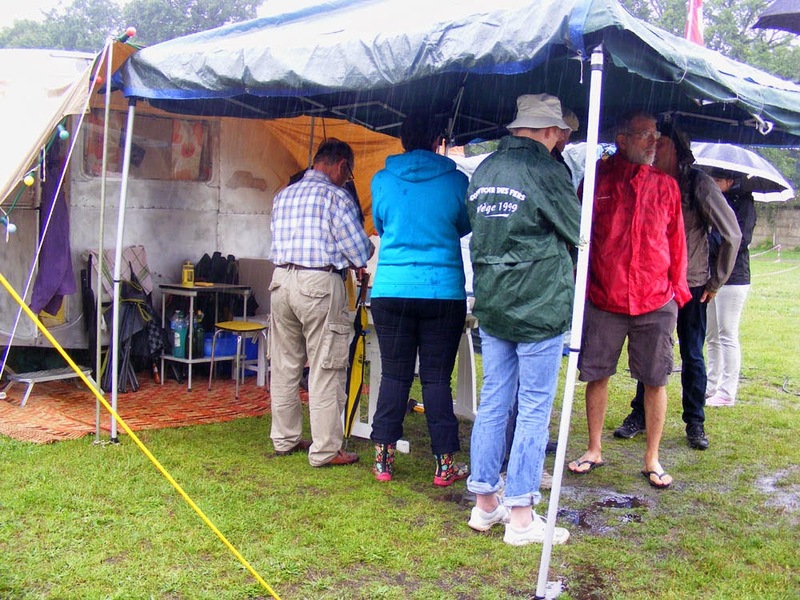 The building is watertight and can safely sit for many years as it is. It is just a shame the building will be in limbo, empty. 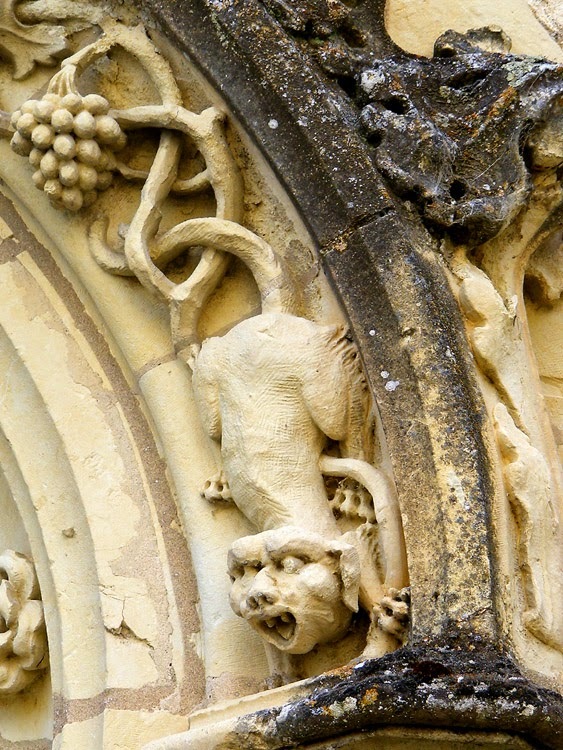 If you happen to pass this summer and the courtyard door is open, make sure you take a peek. 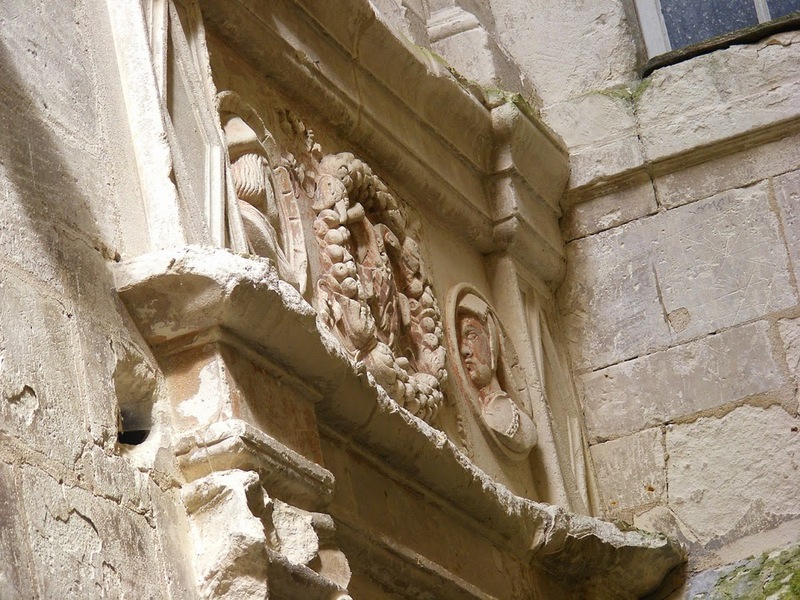 You will see this charming portrait above the door of the Renaissance couple who constructed the house. Normally the courtyard gate is closed and you don't get to see this rather special sculpture, although the scene of Hercules loosing an arrow at the centaur who has kidnapped his wife is fully visible from the street. 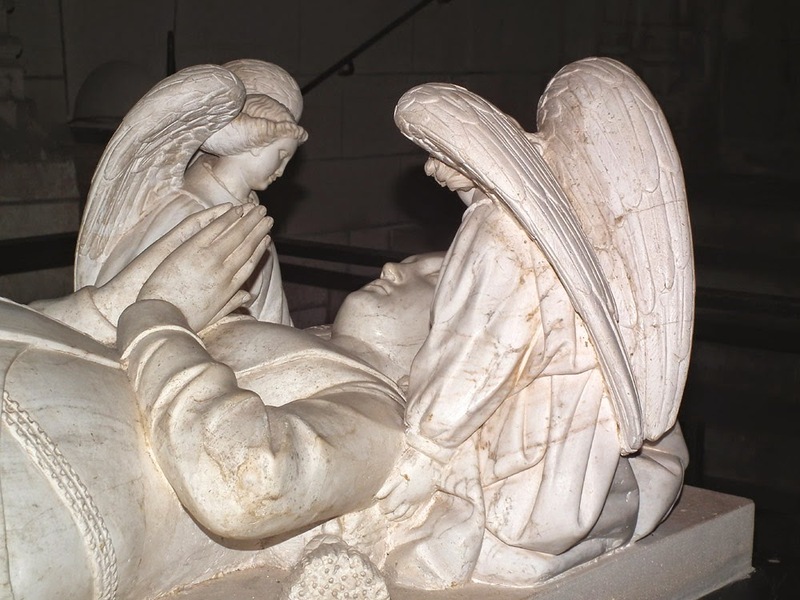 The lovely Agnès Sorel rests in peace, tenderly watched over by marble angels in the church of Saint Ours. 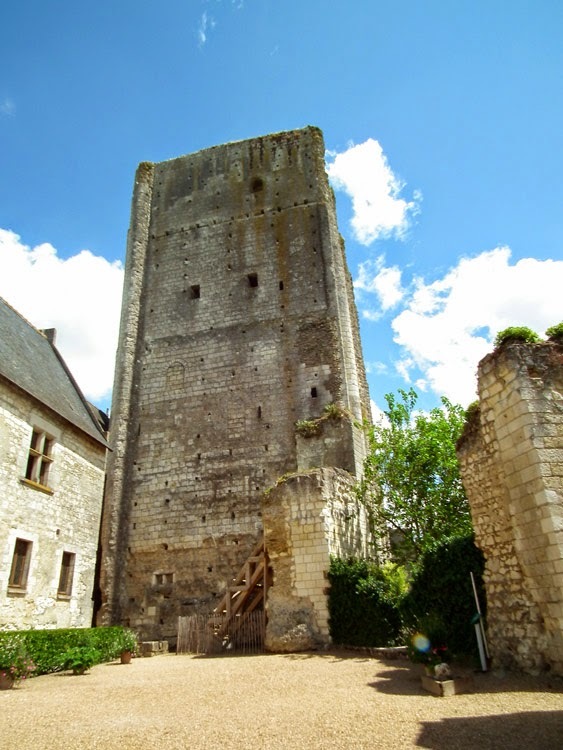 A thousand years old, the ruined donjon looms over the town, probably the first stone built defensive tower in France since Roman times, and still the tallest. Donjon = castle keep, not dungeon. 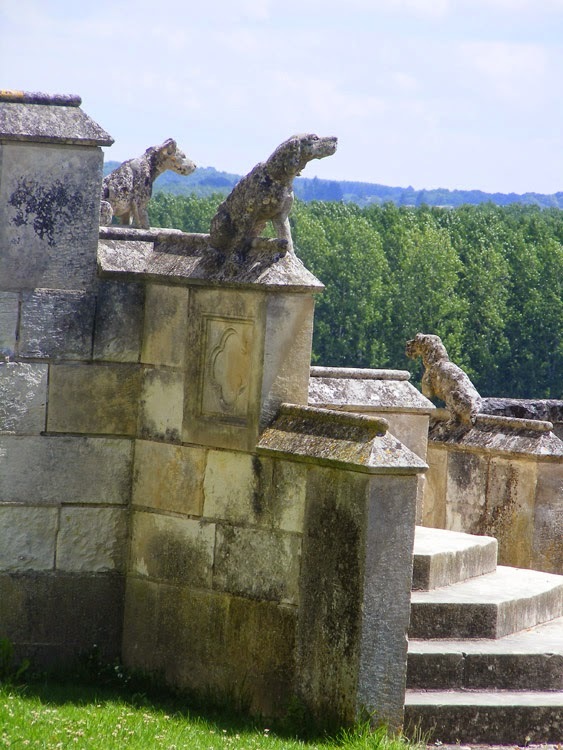 These faithful hounds have sat sentinel on the steps of the Logis Royal for more than 500 years. 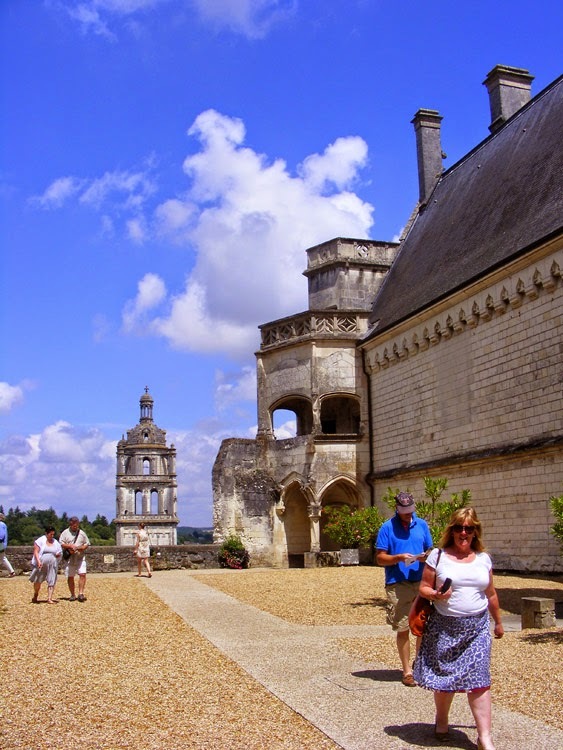 This is about as busy as it gets at the Logis Royal, even on a hot summer day. Looking out over the ruins of the medieval castle. 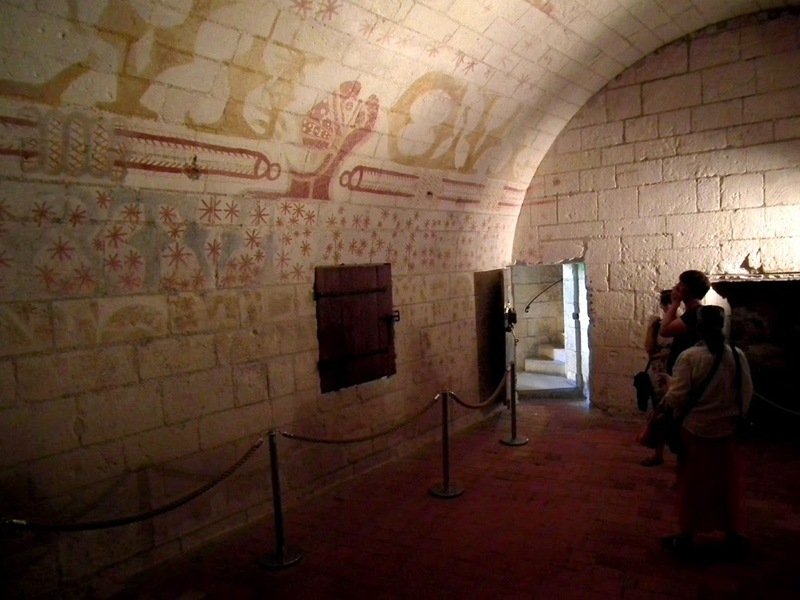 Ludovico Sforza, the great Renaissance patron of the arts and Duke of Milan, spent his last 4 years in this damp dark cell (= cachot, which comes closer to the meaning of the English word dungeon). A geophys search for his likely burial place has been conducted recently. I don't suppose he realised when he enjoyed time in Leonardo's workshop years before, learning how to paint frescos, that his experience would be put to such a melancholy use. 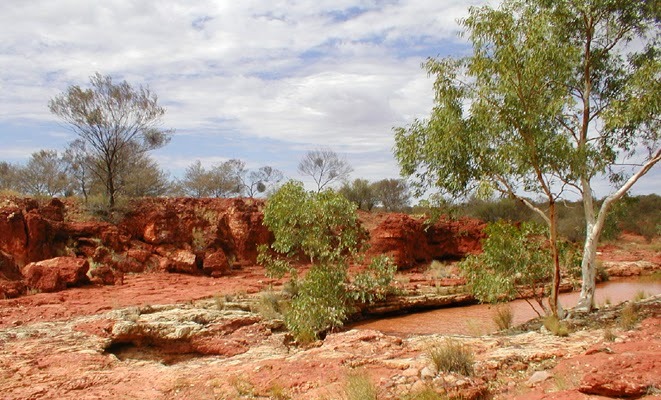 Kings Creek in the Northern Territory. 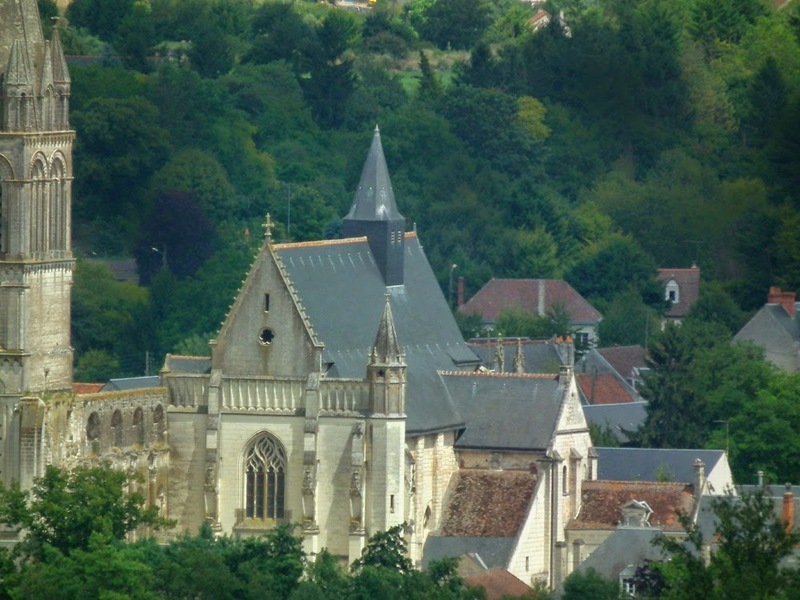 This is the 15th century church of Saint Laurent La Sainte Trinité in Beaulieu lès Loches, photographed from the top of the Louis XI tower across the river in Loches. The Renaissance church incorporates the chancel and one transept of the early medieval church built by local bad boy Foulque Nerra, Count of Anjou, to house the piece of the true cross that he nicked in Jerusalem on the first of four pilgrimages he made to the Holy Land. To the left is the ruin of the Romanesque nave of the Benedictine abbey and the one remaining tower (12th century). Parts of the facade were rebuilt in 1905. 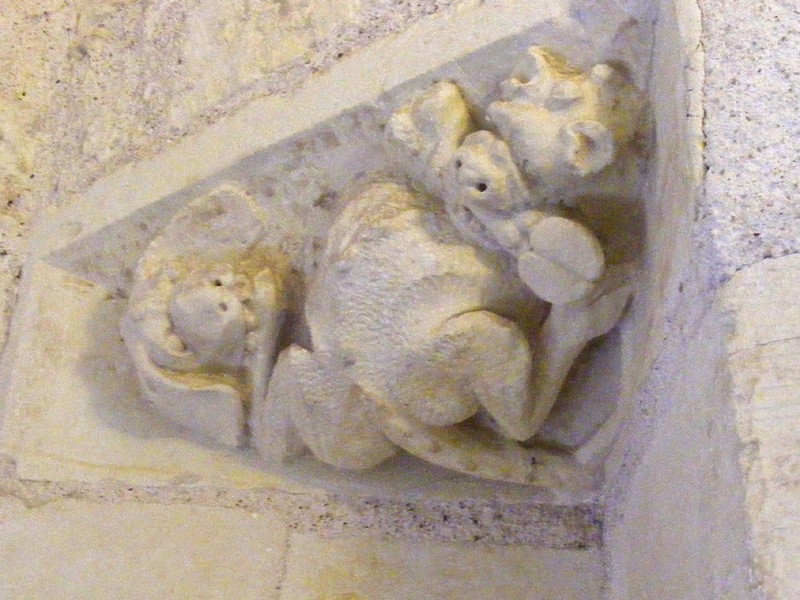 Foulque himself is buried in the south chapel of the church, having died at the ripe old age of 70 in 1040. 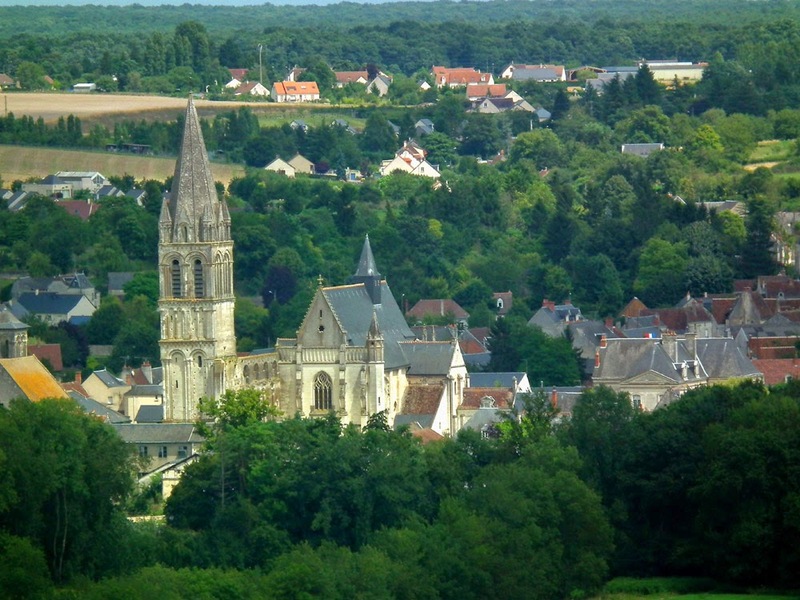 The original abbey is contemporary with the one in Preuilly sur Claise, both having been established in the first few years of the 11th century. You can see another view of the church here on our blog and a bit more about Beaulieu and Foulque. Touraine Trekkers: Gaynor has posted on La Petite Presse about Wednesday's ramble near Vicq sur Gartempe, with photos of the walkers including us. 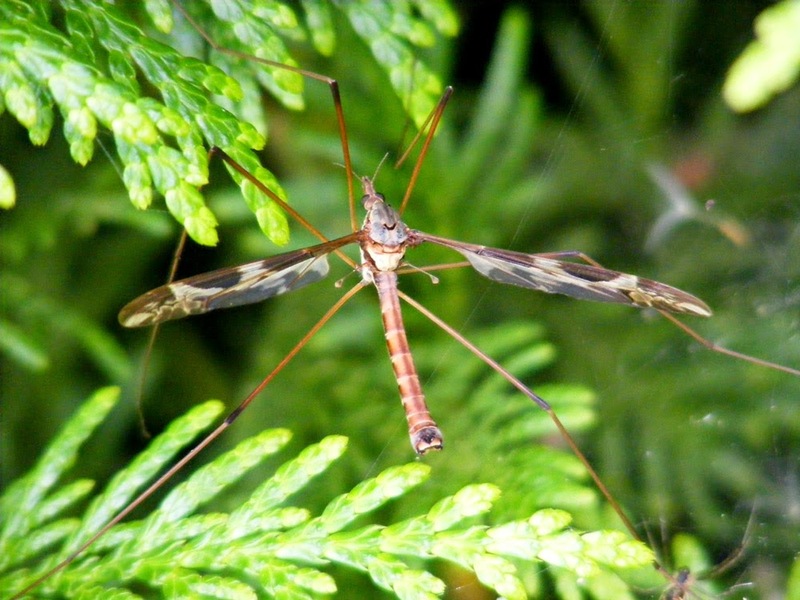 The first was Tipula maxima, a crane fly with a span of 10cm from toe to toe. He could easily have grown from a larva in the little stream that runs down the front of the orchard. They can be seen on the wing from May to July and are reasonably common. 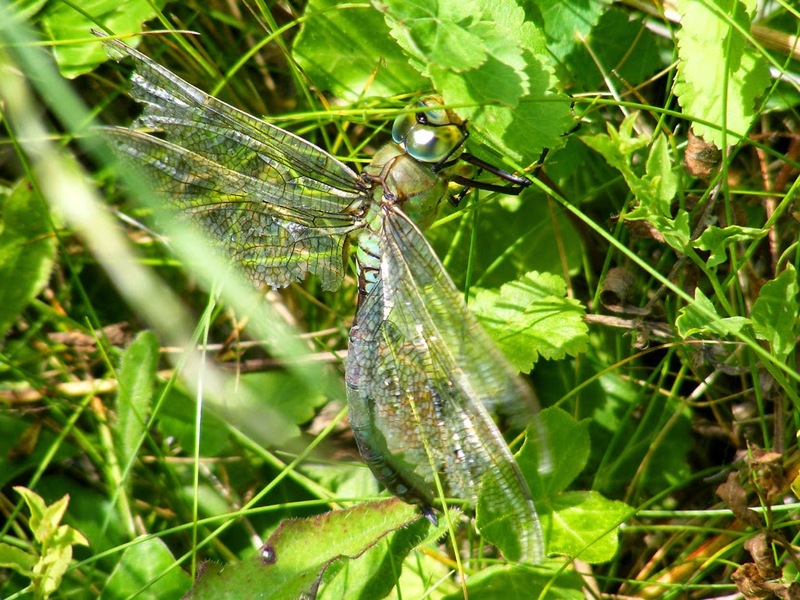 The second was an old and battered Blue Emperor dragonfly Anax imperator, who seemed to have got himself a bit tangled up in the vegetation. He managed to take off, despite the damage to his wings, which I suspect was not caused by this incident but by general wear and tear over the past few days. He can't have had many more days left to him though. His apple green thorax and sky blue and coal black abdomen were dull and faded. However, if he had encountered T. maxima then than would have been lunch sorted. That disease most dreaded in Europe of tomatoes and potatoes has struck our potager. 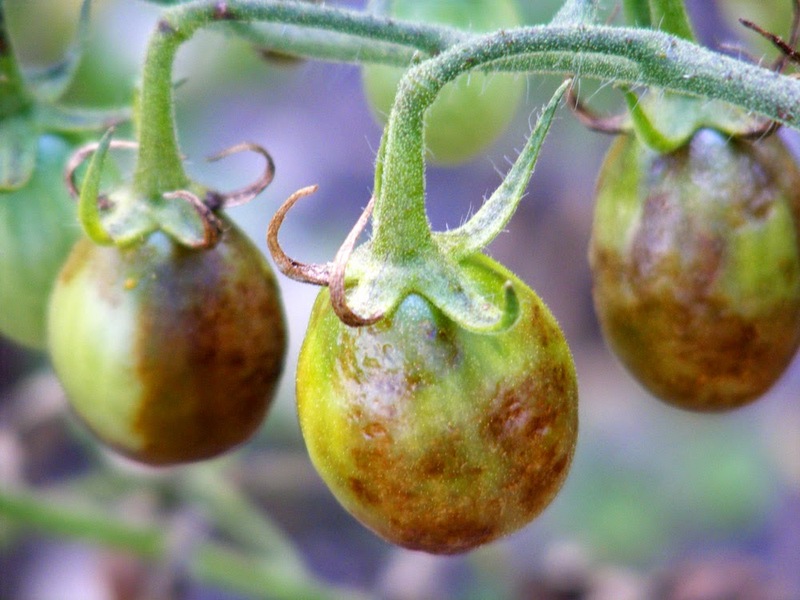 Our tomatoes are going brown before they've ripe and and their stems blotchy. I suspected blight, because other gardeners had been telling me they had it this year. I'd never seen the disease before, as it doesn't occur in Australia, and I've been lucky enough never to have had it before in the garden here. 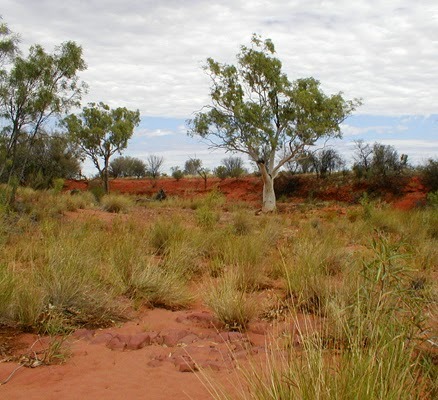 (This is why phyto-sanitation at borders matters and why Australia is so strict.) I looked up the Royal Horticultural Society page on the subject, and sure enough, my tomatoes looked exactly like the pictures on the RHS website. First brown freckles appear on the stems. On Saturday I pulled out all the affected tomatoes (half my crop) and bagged them up ready to go in the green waste disposal at the tip. This is one of three options for dealing with the plants suggested by the RHS. I'm not totally convinced that I'm not just passing on my blight problem to someone else, but digging a deep enough hole to bury them in a place that wasn't going to be disturbed, or burning them, seemed logistically quite difficult. Then the freckles coalesce into nasty leathery brown patches. The frustrating thing is that all the affected tomato plants had healthy leafy growth and burgeoning tomatoes on top. The disease, even on the worst affected plant (naturally the biggest plant with the most tomatoes on...) had only reached about half way up. However, the whole plant will inevitably be affected once it starts, so I am not even attempting to ripen the perfect looking tomatoes on the kitchen bench. They've all been thrown out with the plants and the fruits that have gone brown. The other frustrating thing is that the plants had fantastic root systems, far reaching and robust, responding to my new watering technique using a trench down the middle of the bed. This method of indirect watering should be ideal for preventing blight, as it minimises water splash and the plants don't get wet. I'll definitely use the technique again. I've just been unlucky with the humid weather this year. I've decided not to grow tomatoes or potatoes at all next year, and then not grow them in this year's bed for a few years after that. All volunteers will be ruthlessly expunged. The fruit starts to go brown. In previous years I've grown some tomatoes in pots at the house, as well as in the potager, as an 'insurance policy', but this year I decided not to. The potted tomatoes are quite a bit of work, requiring feeding and watering more frequently and we are not always home to do it these days. What I'm hoping is that the tomatoes at the other end of the bed, currently unaffected, will stay that way, but I think it's likely that I will lose at least a couple more. I'm hoping the ones that are the other side of a zucchini plant to those I've just pulled out will be protected by the intermediary zucchini and not pick up the spores. We'll see. 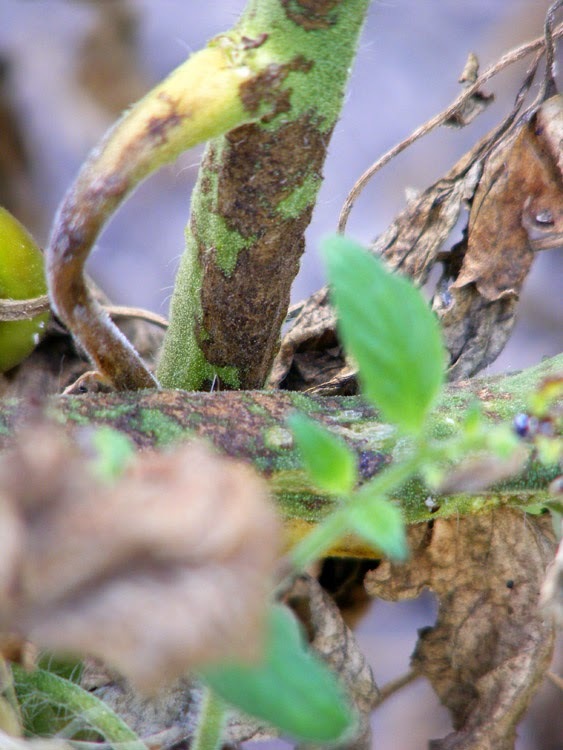 Of course, these plants that might survive are the weediest, least productive tomato plants of this year's crop. Newly dug Stemster (aka Prospère) potatoes. Last Tuesday I dug the potatoes because their leaves had gone yellow and noticed that some of the tubers closest to the worst affected tomatoes showed signs of blight too, although there didn't seem to be any signs of the brown blotches indicating blight infection on the above ground parts of the plants. 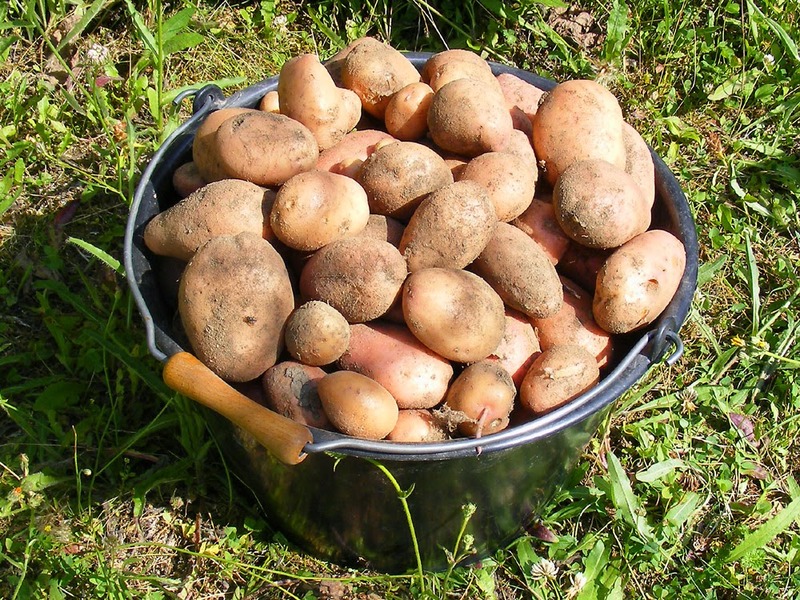 I got 14kg of potatoes from 22 plants. Not too bad I thought. They were planted for me by our friend Liselle while she was here in April, and as an experiment I got her to sow some 'wildflower' mix to try to keep the weeds down. It worked very well and was really pretty, but it did make the spuds more difficult to dig. 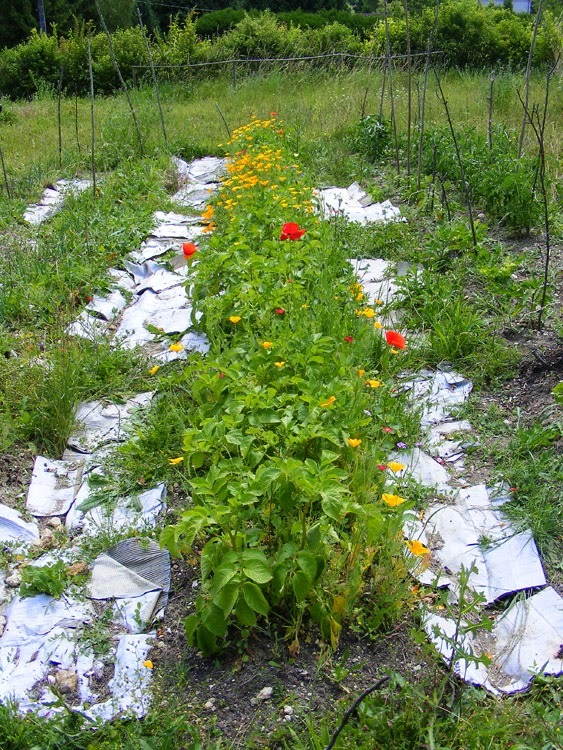 The potato bed on 1 July, with its gaily coloured 'wildflowers' -- Californian Poppy, Field Poppy, Patersons Curse, Lavatera, Flax, Cornflowers, Arabis, Calendula Marigolds, and several others. I've cooked up any tubers that are clearly affected by blight, but there are probably more in the potatoes I've stored in the pantry. I'll have to keep an eye on them and may end up cooking a lot of potatoes very quickly. Thank goodness for freezers! Chunks of cooked potato don't freeze well, but mashed potato does, and we mostly eat potato as mash. The disease, caused by a fungus like organism, rots the potato just under the skin, causing lesions. 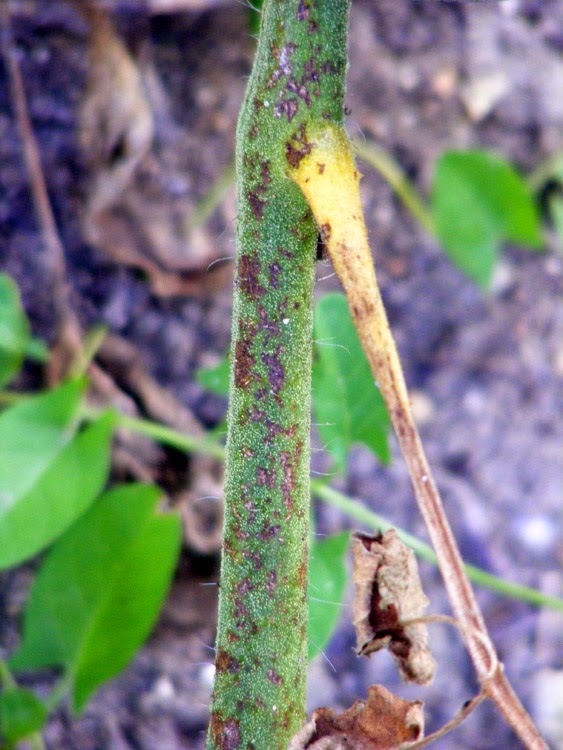 Like most of these 'fungus like organisms', in this case Phytophthora infestans, an oomycete, there is no treatment once the plants have the disease. As you have probably guessed, the organism was the cause of the potato famines all over Europe in the 1840s. The only possible treatment by the home gardener is prophylactic applications of copper based biocides such as bordeaux mix, which is so appallingly toxic to man and beast that I really do not wish to use it, especially multiple times throughout the season, just on the off chance there is blight about. A la cuisine hier: Potato and leek soup, with added courgette, pureed, spiced up with a hint of ras al hanout and enriched with cream cheese. Another two courgettes successfully disguised.